Poplar is both widely available and relatively inexpensive. Most home improvement stores stock it in 1/4″ and 3/4″ thicknesses (surfaced on all four sides) and most hardwood dealers stock it. Discounted by some for what they consider bland grain patterns, with a little work you can find a surprising range of color in this easy-to-cut hardwood. Poplar can range from white to grey, purple to yellow—sometimes in the same piece. While these colors stay vivid for awhile, they eventually fade unless carefully finished and protected from the sun. Poplar can be stained to look like a variety of higher-priced hardwoods. The grain is nondescript enough that with the proper stain, it can take on the appearance of walnut, mahogany, or maple. Poplar is also a good wood to paint. Properly dried, it lacks the resin and sap that make painting pine difficult. It also lacks the oil that some other hardwoods have that make paint blister. The open grain makes it a good choice for leather and fabric dyes. Just remember that these dyes may raise the grain, so be sure to sand after dyeing and apply a clear finish coat. Poplar cuts easily and is relatively soft, coming in somewhere between pine and walnut. Because it is so soft, you can cut stacks up to 1″ thick without a lot of trouble. 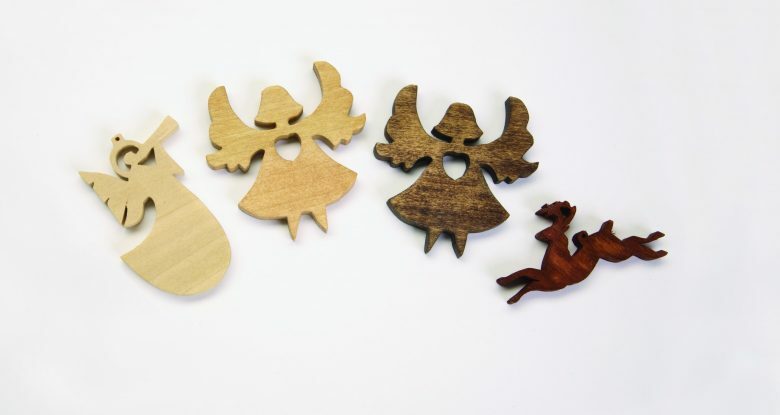 It is easier on blades than plywood, which makes it a good alternative for ornaments. It is strong enough for ornaments, boxes, and most fretwork. It will ding up easier than some hardwoods, so use caution when making items that will get a lot of use such as puzzles for children. Used properly, a router gives you a nice cut with poplar. But it will burn easily if you leave the router bit in one place for too long. Be aware of the grain direction when using a router; practice on scrap wood first to get a feel for poplar—especially the endgrain. Use caution when sanding; coarse-grit sandpaper will remove a lot of wood fast! Poplar sands well, but tends to give you a fuzzy finish. To prevent this, spray the wood with a mixture of equal parts rubbing alcohol and water before your final sanding. This will raise the grain and give you a smoother finish. For most projects, it isn’t worth using sandpaper finer than 220-grit before applying your finish. Poplar fills in the gap between high-priced hardwoods and plywood. Scrollers should keep a few pieces around for basic projects because of its versatility. 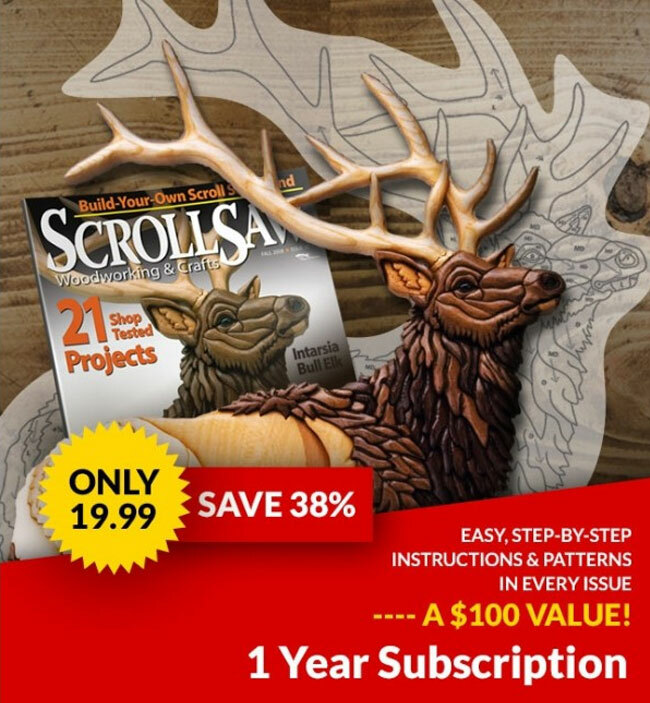 But because of the softness of the wood and the difficulty achieving a polished finish, I wouldn’t recommend using poplar for your ultimate scroll saw masterpiece! 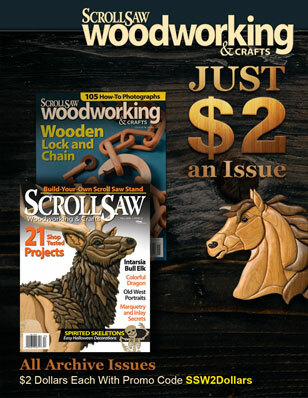 Discuss this material on the Scroll Saw Woodworking & Crafts forums. Read more about materials for beginners!